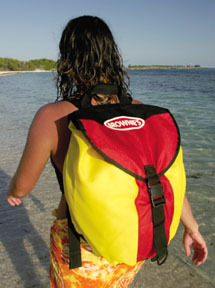 This simple utility bag is great for storing dive, boat or any kind of gear. It's generously sized (31" L x 14" diameter) and the tough deluxe mesh withstands abuse and allows for plenty of air circulation. A black Cordura™ bottom keeps sand out and won't show dirt. Semi-rigid handles are comfortable and easy to grab. Attractive, tough, and dependable. 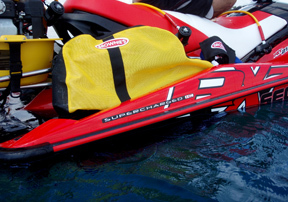 This easy carry snorkel bag allows you to strap your mask, fins, snorkel on your back and walk “hands free” to beach or boat for a spectacular day of snorkeling. Snorkel Bag, 34" x 13"
Snorkel Bag Long, 41" x 13"
Wide-mouth deluxe mesh bag carries everything from a kayak diving hose kit to a towel and sun block! It's the perfect size for boating or the beach! Also available as a backpack with adjustable straps. Made of durable ballistic nylon and a heavy duty non-corroding zipper, this padded carry case is sure to last. Ergonomically molded handle makes carrying this case comfortable and the internal sleeve is perfect for organizing paperwork, manuals and logbooks! Bag measures 17" x 13" x 6". 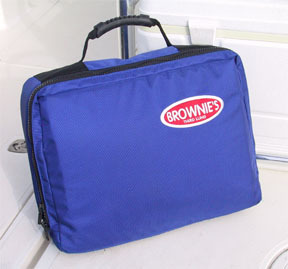 This simple utility bag is great for storing your Brownie's hose kits and regulators. 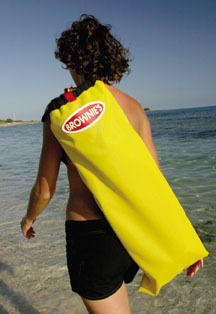 Or if you decide to go snorkeling, place fins, mask, snorkels and more. It’s generously sized (32” L x 15”H x 6" W) and the tough deluxe mesh withstands abuse and allows for plenty of air circulation. A black Cordura™ bottom keeps sand out and won’t show dirt. Easy grip handles are comfortable and easy to grab. Attractive, tough, and dependable. 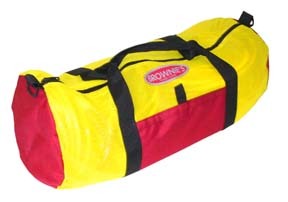 Contact Us for more Brownie's Gear Bag information.